Lake Grapevine is a perfect place to spend the weekend fishing and spending the night in some great fishing cabins on Lake Grapevine. In addition to fishing, when you stay in a Lake Grapevine Fishing cabin, you'll find lots of other fun things to see and do in and around Lake Grapevine. See the Resource Guide below to learn more. 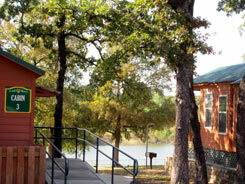 The Vineyards Campground on Lake Grapevine has 8 one bedroom cabins that are excellent for spending a weekend or longer fishing and exploring Lake Grapevine. 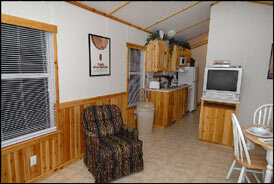 The clean cabins are fully equipped for cooking your fish dinner, are heated and air conditioned, will sleep 2 to 6, and include a TV, microwave, coffee maker, and more. Plus there is an outside deck and a picnic table and grill. And you are less than 300 yards to the water. The Vineyards is well landscaped, heavily treed, and well maintained. You'll find a boat ramp, courtesy boat dock, kayak rentals, a general store, full hook-up RV sites, a fishing pier, and more. The Vineyards Campground on Lake Grapevine is one of Texas Outside's Top Rated RV Parks - read our review to learn why.